Understanding the relationship between thoughts, emotions, body sensations and behavior is a first step towards making changes. 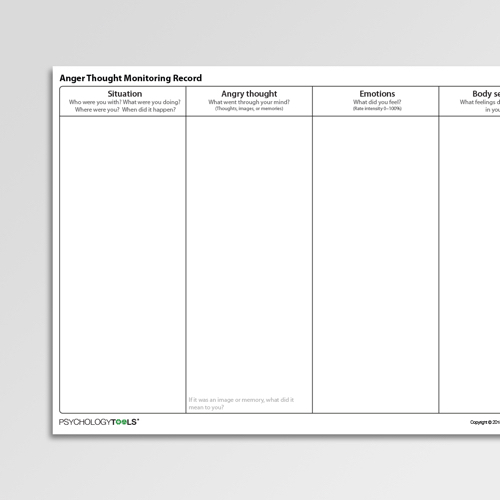 The Anger Thought Monitoring Record helps clients to better understand how their anger operates. This Anger Thought Monitoring Record is designed to help clients to better understand their angry thoughts and emotional / physiological responses. In the first column (Situation) clients should be instructed to record what they were doing when they started to notice a significant change in how they were feeling. 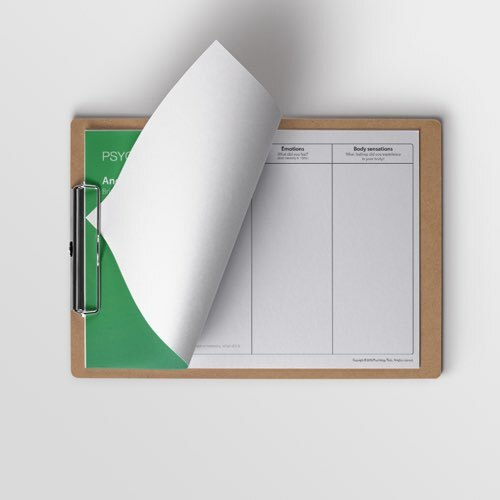 Training clients to record specific details (such as who they were with, where they were, and what had just happened) is often helpful when later elaborating a memory for an event, or simply in understanding the reasons for subsequent thoughts and responses. In the third column (Emotions) clients should be instructed to record their emotional reactions in that moment (which can typically be described using single words, e.g. angry, annoyed, frustrated). Clients should be encouraged to rate the intensity of these sensations on 0–100% scale.